Have you been to Rena Klingenberg's updated newsletter site? 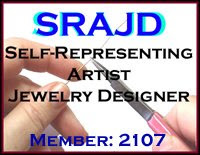 Here's a link: http://jewelrymakingjournal.com . In her Newsletter #170 I found Boogs Bracelets. I think what Susan Goldstein has done to memorialize her mother, she died of cancer, is simply brilliant. You can find her at http://www.Boogsbracelets.net/category_9/Cancer-Awareness-Bracelets.htm . She hasn't got all the types of cancer up and running yet but you can find breast, pancreatic, ovarian, liver, colon cancer already up and running. As she continues adding to her bracelets for cancer I hope she won't forget those incredibly important people - the Caregivers. One last link: http://www.cancersociety.ca From the homepage you can pick your province and get busy in the name of the person you know who has cancer. I'm all over inspired thanks to Rena and Boogs Bracelets. I have been away a long time, haven't I! So, I've been caring for my sister who had back surgery in September. Even now she's not back to 'normal' because it was her 2nd major surgery in 8 months (in the spring last year she had surgery for her cancer). Then I had surgery 10 days before my birthday last year. I got pretty cocky about my recuperation and it put me in such a state! I can't describe what I went through but I became dehydrated and had to swallow those horrid supplements to get electrolytes in order. I told you I can't describe the whole thing! The bad thing is I endangered my health. The good thing is I lost 30 pounds. Since then I pulled out a rug project I last worked on about 10 years ago. Maybe longer. It's petitpoint (40/inch count) and will be about 4 or 5 feet long and 2 feet wide. And I have been happy working it..
Then a friend came by with 5 necklaces needing repair. That was 2 weeks ago. I've restrung 3 of them and have but 2 left. But I've got some ideas that I think are good. And that has got me pulling out my beads and scanning books for good ideas: maybe new techniques and definitely bright and cheerful colours. So there you are. I'm back kinda. We'll see how things go. And what of my blogs? I've already shut down WordPress because there are too many changes being made that don't come with instructions that I can understand. And this blog? I rather favour Blogspot because I can add so many widgets so easily. It has provided me with a venue to pass the time of day that feels so comfortable. What needs changing is its name. I'm going 'inactive' on this blog. And I'm activating a WillUBead.Studio blog on BlogSpot. Finally, I thank every one of you who have chosen to follow my goings on. You are a wonderful bunch of creative people. Now, I invite you to visit me at my new blog. I found something interesting in my inbox when I opened it this morning. It was an announcement from Lezlie Winemaker about her studio tour in Thornhill. It's the 13th annual Mother's Day Studio Tour. And she has called for lampwork students to register. It's something I've wanted to learn but Bead FX, where Lezlie will be doing the workshop, is so far away. Do you know Lezlie? Silly me! Everybody knows Lezlie. I've told you about her in past posts here. She's the driving force, the inspiration, the personality in DreamGlass.ca. She has strong family support that allows her to travel the globe to show her works of wearable art. Her mum and auntie held the fort at the Spring One of a Kind show in Toronto while Lezlie went to the trade show in Las Vegas. On Saturday last, I attended the Toronto Bead Society's Spring Bead Fair as a volunteer at the Society's table. What little I saw of it was marvellous. Did I see the people I wanted to see? Only from afar. I got to my destination with difficulty and only 5 minutes late. Will I volunteer again? I expect I will but I'll be taking somebody along who can help me: it took too much out of me just getting there and home again. It's a must see on any beader's list of shows and is held twice a year: Spring and Fall. The next show will be October 31 to November 1 2009: the venue will be the CNIB, 1929 Bayview, Toronto. There was a slough of shows and studio tours and the like with their flyers at the Society's table. There's a lampwork trunk show on Saturday May 30, 10 to 5. And the Toronto Gem & Mineral show is coming to the Don Mills Civitan Arena ~ 1030 Don Mills Rd in Toronto ~ July 24 to 26. New to me but comes highly recommended is the Textile Museum of Canada's More Than Just a Yardage Sale. Did I say 'highly recommended?' It is the 'must see' of all shows. The sale is Friday May 29 ~11 to 6~ and Saturday May 30 ~10 to 1. A personal favourite is the Jaboli Open House June 25 to 28, 10 to 5 at 575 Watt Street in Fergus. You are invited to tour their workshop and have Tea with Nana. Jaboli is a business of and for gentlewomen. Adjectives to best describe their work? Incredibly detailed. Original. Friendly. Ageless and age appropriate. I've not attended the next 2 shows but they would make a lovely day trip: Fairy Lake Artisans Festival and the 31st Thorold Arts and Crafts Show. Details for the Thorold show can be had by emailing cathy.henderson@sympatico.ca. Some of these flyers we collected when we visited the Milton Farm Craft show in Milton. This show is held 2x a year and this year I was there on business: it was a bonus that I enjoyed it. This year's spring show had some new vendors and there was more space per vendor than usual. The traditional rain fell on Saturday and we missed it because we went on Sunday: it was a glorious Sunday. Marg and I picked up the work of Asem Nada who, with his wife Laura, is La Glasserie. I commissioned some glass leaves and they are beautiful. These leaves are about 2.25 inches from tip to bail and almost 1.5 inches at their widest part. I've commissioned more leaves from this talented man that should be better suited for earrings. Interesting Find: Jeff and Dye's Hermit Studios. They have a jewellery business with some original work AND some interesting techniques. Have you heard of Song Feathers? Hermit has them. I have been busy, haven't I!! Well, I've been a busy little girl lately. I did my Bead Oasis booth. Then I got sick. Then I was out and about with my sister who was on vacation: lots of mall crawls. Then I got sick. I got a doctor's appointment to check out my badly swollen thumb ~ I am in the midst of an arthritis flare up. Then I got sick and missed the lecture downtown to help starving artists with the business end of art. And that more or less brings us to today. I want you to read what Jean Campbell, yes, the Jean Campbell who co-authored The Beader's Companion, says about our personality and our beads. She offers ideas for our next pieces that should stretch our minds. I got the inspiration for an artisan jewellery commission I have thanks to this article. Oh, yeah, I've discovered something new about myself: it seems I hibernate over winter. I'll have to work on my dark and quiet months to get my beaded pieces completed. And, I'd like to announce that I've finished my March challenge. A bride to be married in July will be pulling together the odds and ends associated with her wedding. She has the hall, and the church. She has her dress and lined up the groom's wardrobe. She has done the same for all the wedding party. She has her flowers and the caterers and the makeup/hair and the cake taken care of. And she has ridden shotgun as the 2 mothers vie for dominance over the bridal pair. This should be a happy time for the bride, but .... Everything has become a job with an incredibly tight time constraint. At least, that's the way it feels. But wait, there remains the gifts for her attendants. How do I fit in? Aside from 'being there, done that, got the divorce to prove it.' 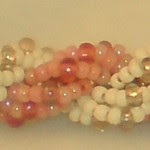 Well, 5 or so years ago ~ how time flies ~ I swapped bead stringing lessons for a consultation from a dietitian. She had special family heirloom beads and strung the necklace and matching earrings for her daughter to wear at a wedding. Now her daughter, Sarah, has sought me out to make the jewellery for her 9 attendants and herself. Lots of 3strand stuff. You have to know, too, that Jessie has returned with another well loved necklace she wants to wear at her daughter's wedding. It needs tweaking and a new clasp. Did I mention? Jessie breaks into a rash with all metals save the most expensive. And that means the clasp will have to be beaded. Exactly the same as the clasps of the bridal jewellery. Only different. And that is my April challenge. Not so much the stringing of a single strand of pearls, but the variety of clasp beads and their associated loops. These buttons are an exotic version of a toggle clasp and without the metal. And these buttons, if made in lots of designs and sizes, can be made into earrings, pendants for a necklace or a bracelet. Even button covers and shoe buckles; you know, the fancy kind of buckles. So, where are the pix to show you my wonderful March challenge? The bride hasn't seen the jewellery yet so these pix are still on hold. There's no way I want to steal her thunder by letting the wearable art we designed together slip to the outside world without her go ahead. I haven't shown these pieces of artisan jewellery to her mother, even. And for May? May is going to be a busy month for me. And an expensive one, too. I'm still all a-pearl and beaded beads ~ they fascinate me ~ and 2-hole buttons and my expanded stash. That happened at the Bead Oasis show. I met Meagan who was de-stashing and who gave me an incredible deal for some of her beads. They still sit in plastic bags but I'll be transferring them to spice jars soon. Imagine the king in his counting house or the dragon protecting her accumulated treasures and that image will fit me right down to the ground. For now, though, I've gotta run. I'm writing projects for some kits I'm developing. What did you do this past weekend? Did you enjoy doing it? Did it have anything to do with the making of artisan jewellery? Would you rather have my life? Huh?? My sister and I wandered the aisles of Toronto's Spring One of a Kind (OOAK) Show on Sunday. Our wanderings took us 4.5 hours to complete but it was worth it this year. There were some new artisans and different arts/crafts being shown. Some of our favourites, like Roothams, weren't there but this year the Eastern Ontario CFDC (Community Futures Development Corp) rented a huge bit of real estate right in the middle of the show and sponsored artisans from Eastern Ontario. For me as a wanderer, it was a great success. I met artisans who otherwise would be unable to show with OOAK. I had many a chat (that's why it took so long) and got some leads for my business. For example, Alfie Fishgap, and his boothmate Todd Jamieson, told me of a show at Fairy Lake in June. I found some not so new stuff being used and in wonderful colours, too. Like the crochet wire rings and the crochet wire bracelets. My sister is my model/sales rep and she stepped up in many a booth to point out the artisan jewellery she and I were wearing that I made. Doing that in my friend Alfie Galda's booth (AB Originals) ~ she knits sweaters that are to die for ~ made me a new friend, Gwen. She's an enthusiastic fan of Alfie's and wears a lot of sweaters Alfie has knitted and I'm hoping she will like my artisan jewellery enough to be as enthusiastic about my work. I found something really annoying. Well, I found 2 things really annoying. I have picked up several really helpful lists and recipes but the person who gave them to me didn't put on their website or some other contact information. I have no idea who gave me the recipe for cleaning copper. And it isn't Twinkle. BRAND BRAND BRAND~~Put your CONTACT INFO on everything you do: it may bring you business after the show. There was a booth with items from Uqqurmiut Centre for Arts & Crafts, Pangnirtung, Nunavut. Beautiful things from the First Nations of our True North, Strong and Free. The 2 people in the booth when we visited were wearing their snow goggles. They look almost like goggles you wear in the tanning salon or on swimmers except there is a narrow slit from 1 side to the other to peer through: they keep out the glare of the sun bouncing off the snow. As I said, some of our favourites were there with newly designed booths, some were there and their booths were wholly recognizeable. One such was Asem Nada, my glass man. His business is La Glasserie. His work with a torch and a cane of glass is marvellous: I have many of his pieces in my home and he covers Easter and Christmas, too. Well, my exciting news about Asem is that he made a leaf pendant for me and brought it to OOAK to show me. I think it's beautiful and I've ordered 20 of them. I can pick them up at Milton in May. Now you have to wait to see them. It's true, they are worth the wait, as all of Asem's glasswork is imaginative and beautiful. We had a busy day and a wonderful day. And both of us were exhausted when we got home and both of us ended up in bed before our bedtime. PS: I receive no money or other consideration from the businesses I mentioned in this blog, nor from any other business, unless stated in the blog. Well, I'm back. I'm still riding the wave of excitement I had throughout the Show. What show?? The 'Almost Spring' Bead Oasis Show, 2009 of course. My very firstest show. This Show is organized/sponsored/brought to you by NLM Glass Arts andNancy 'n' Sam took good care of us. It is directed at the artisan jewellery world rather than the fine art jewellery of the sort you see in Birks. The artisans are a wonderful group of people who watch out for, share, and support one another. Just for that alone, the booth was worth every penny it cost. In monetary terms, I took a bath (that's a monetary term, isn't it?). For somebody on an incredibly small budget, it cost a lot of money just for the booth fees. In practical terms, I roped in the sun!! I had an incredible education that I couldn't get as an attendee. From my side of the table I saw some really gorgeous jewellery worn by the people who visited our booth. Great ideas from that. And many people stopped to chat and discuss. I gotta say it: we were invited into people's personal lives, shared our experiences, and gave and received hugs. These people were so brave and so trusting. I met some people interested in my work and wanting to put it in their shops. I received a wedding commission for bride's and 9 attendents jewellery. MMMMM You should see the pearls I got for this young lady. I received the all time best deal ever from a young woman de-stashing. I was running my fingers through all those beads last night and dreamt of how I would use these beads. I know how to present my kits better now. And I've been asked to write other kits I hadn't thought to do before. On top of all that, I had some of Joann's kits from http://www.beadkitsbymail.com/: her kits are stuffed with instructions, beads and even 2 beading needles. There's more. I also had the DVD of instructions for 5 projects from http://www.beadsbyu.com/: that DVD included a free kit of 1 of the projects. The booth took almost twice as much time to set up as it did to tear down. That figures. And the glass bead artisan jewellery on sale needed straightening several times during the day. My trolly is still sitting in the kitchen: I'm removing things slowly with the good intention of putting it all back in its place. If you know me, that means piled high: nothing seems to have a proper spot in my PigPen Studio. Artisan Jewellers are advised to wear their jewellery: they are, or should be, a moving billboard ad for their own wearable art. I am not very good at this but my sister is wonderful. Much of my 'big' artisan jewellery designs is worn by her because she has the personality to carry it off. And I, through her, received many compliments on what she wore. The lesson to me, aside from the obvious 'wear it,' is to have the big bold pieces in good supply. I has been a remarkable 3 day show and I got home exhausted. Two days in bed, I'm almost 100% again, and still the ideas are swirling in my head. I have a lot of sorting and writing and ..... to do. A big lesson was to ensure my computer was working: it got moved and jiggled and disconnected and ........ I ended up losing one of my kits and I have to re-write it. To add insult to injury, my machine accidentally got pushed to the back of the keyboard shelf and it and the shelf fell down, went boom. On my foot. There's another show in September and you really need to go: no matter what side of the table you are on it is worth the trip. And the entrance fee is only $8.00. Canadian money. It's worth the visit to Toronto. A knock at the door this morning but nobody there. A parcel left at the step. But not a baby in the human sense of the word. And they are here. Safe and sound. A kit includes the beads and findings. And a reel of beading thread. And 2 beading needles. A smart businesswoman, Joann has also included her business card ~ that's what she used to hold the 2 needles. I told you she was smart. As of now I feel relieved. I was worried they wouldn't get here in time. They came from the other side of the continent and from a foreign country. Doesn't that sound grand? Joann lives in Sammamish. Yeah, okay. Joann lives in Sammamish Washington state USA. But I am in Toronto Ontario Canada. So technically the kits did cross an international border. Also. Joann sent me an extra kit. I want to get it all done in time to display at the show. The kit she donated to me is the Peaches and Cream Swirl Necklace. Thanks so much for entrusting me with your products. I promise to take good care of them. AND I have to keep in mind that I need more rest than most people and I have to take it so I don't exhaust myself BEFORE the show. After will be okay: I can collapse for a day or two. And then I read a Twitter from Teri_B: she's opened a discussion about home parties for artisan jewellery. Yes, of course, my brain started thinking about home parties. Couldn't help it: Tupperware's home party model kept cropping up. Why re-invent the wheel, or, in this case, the artisan jewellery home party! But I can't get the idea out of my head. This morning I got up early ~ well, early for me ~ and finished up the graphics for the backside of my business cards. I have almost run out of my other business cards so I've taken the opportunity to revamp the design etc. Now they are happily printing. See?? I got something done this morning. The trick is to get something done this afternoon that gets me closer to being ready for the SHOW. Even this bauble babble is helping. It's getting things out of my mind that are taking up too much space and distracting me from my goal. I'm getting older, y'know, and feeling much older than my chronological age. And today I'm feeling particularly brittle. Next week I have to drive to Hamilton for an MRI. Marg is coming with me: I've had MRI's before and come away feeling like everything has been sucked out of me. Since this MRI is in Hamilton and at 7PM to boot, I am going to be in worse shape than usual. And Marg has to go to work the next day. Next week is going to be really crappy. All the more reason to get a lot done this week. Yeah, yeah, I know. I should have started way before now. I have to tell you, that's a very smart idea. But I always avoid things that scare me until the very last moment. This occasion is no different. Good for me!! I think I can focus again on the task at hand. Thanks for your help, good ole Blogspot. Hiya everybody. It feels like forever since I was here. And I've got a couple or three things to tell you about. And it's all here on this blog!! 1~ Are you stuck on a design? Either you've got an idea that just isn't working or worse! you have no idea at all!! In the right hand column I draw your attention to several featrues: Microscopic View of the world, Astronomic Pic of the day, and Masks from around the world. Microscopic ~ it is amazing the shapes and colours of things so small the eye cannot see them. Do a quick rough sketch of a 'thing' and then start bringing together the beads and threads and such you will need to render this 'thing' in beads. You are not likely to go away and come back to do it. The bugs'eye view changes every time you move away from the page. Yup, there are that many wee things that they can populate every blog view with a different wee-un. Astronomic ~ not astrologic. We gaze at the heavens and marvel and ponder our place in that heaven. Here you will find things about the sky: the stars, planets, weather, ... Maybe you'll see the Northern Lights or the Southern Lights. Or a view of the wake of Halley's Comet. Start sketching. Don't try to define anything. Just move the pencil around, keeping your eyes on the screen and not on your sketchbook. After you've done that you can look at what you've done and think about it in terms of beads. Would it make a lovely beaded embroidery? Or a piece of artisan jewellery, something that will make a statement? Masks ~ I spent 25 years in Canada's western province and territory ~ 2 years in Yukon Territory and 23 years in Vancouver BC. I revelled in the artistry of the Pacific Northwest First Nations people: their work is wonderfully graphic. Clean lines, limited colour palette. Spiritual meaning in their totems; whether on a pole or on a piece of artisan jewellery. The most famous among these First Nations of BC is, perhaps, Bill Reid. His work is in the BC Museum of Anthropology and graces the Canadian Embassy in Washington DC USA. Masks are not limited to Canada's First Nations. Borneo, African, American, Mexican, .... The list is as long as ~~ Well, it's immeasurable. As in the Astronomical and the Microscopic exercises, try to draw a mask without looking at the paper. Then do another drawing but this time looking down occasionally. Draw what you see, not what your brain tells you it sees. 2 ~ On a different note, I've just come across a new widget. For artisan jewellers there is a Wire Gauge Calculator, from Irma Pretorius of Wire To Jewelry that will translate a) millimeter to inch and gauge, b) inch to gauge and millimeter, and c) gauge to millimeter and inch. It's a handy tool because there are only 3 countries in the whole wide world that DO NOT use metric: Myanmar, Liberia, and USA. ** You can copy it from this site and add it to your blog or e-store. It's FREE ~oh how love the sound of FREE!! Get it for yourself. And offer it to others free of charge. And keep in mind that this is the Beta version of the widget. And that pretty well sums up what I wanted to say. glass bead artisan jewellery made by 1 person: Me!